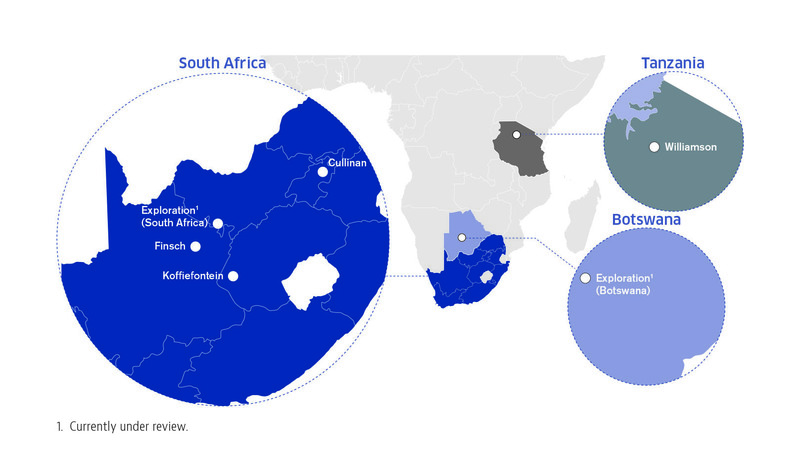 Petra has interests in four producing operations: three underground mines in South Africa (Finsch, Cullinan and Koffiefontein) and one open pit mine in Tanzania (Williamson). The Company also maintains an exploration programme in Botswana and South Africa, which is currently under review. The mining industry in South Africa is highly regulated in terms of its social and environmental performance, with companies having to uphold stringent standards, which in some cases go beyond the requirements of many international best practice guidelines, in order to maintain their licence to operate. The primary legislation governing exploration and mining activities in South Africa is the Mineral and Petroleum Resources Development Act, 28 of 2002 (“MPRDA”). In terms of the MPRDA, custodianship of the mineral resources of South Africa vests in the South African Government (“Government” or “State”) and the Government grants, issues and administers prospecting and mining rights. The holders of a prospecting or mining right may enter upon the land concerned, bring machinery and equipment, build and construct, prospect or mine (as the case may be) and carry out other incidental activities. The holder of a prospecting or mining right must pay compensation to the landowner or lawful occupier for loss or damage suffered as a result of prospecting or mining. The holder of a mining right is required to comply with the terms and conditions set out in the mining right (including such obligations as may be imposed in the social and labour plan, mining work programme and environmental management programme). a Social and Labour Plan (“SLP”) that defines an operation’s obligations in terms of social, labour and community issues. The SLP of an operation forms the basis for its activities and performance indicators over a five-year cycle, following which a new SLP needs to be consulted with stakeholders and approved by the Department of Mineral Resources (“DMR”). Granting or transfer of a Mining Right is subject to acceptance and approval of these documents by the DMR, which will be based on clear demonstration that the resulting mining operations will benefit the “triple bottom line” in a coordinated way. The MPRDA empowers the Minister of Mineral Resources to cancel or suspend a mining or prospecting right if the holder, amongst other things, is conducting its operations in contravention of the MPRDA. Before a right may be cancelled or suspended the requirements of administrative justice must be followed. This requires that a party who will be affected by an administrative decision should be given notice and a consultation procedure followed before the administrative decision that is likely to detrimentally affect their rights is taken. An amendment of the MPRDA is currently being progressed through Parliament which seeks to, inter alia, promote national energy security and enhance provisions relating to the beneficiaton of minerals. See Black Economic Empowerment page. The Mine Health and Safety Act, 1996 (Act No. 29 of 1996) as amended, provides for the protection of the health and safety of employees and other persons affected by the South African mining industry and, amongst others, provides for the promotion of a culture of health and safety as well as the enforcement of health and safety measures or legislation. The main functions of the Mine Health and Safety Inspectorate of the DMR are the provision of policy inputs for the establishment and application of mine safety standards at mining operations; policy inputs towards the establishment and application of mine equipment safety standards at mining operations; the establishment and application of mine health standards at mining operations and promotion of the application of the standards mentioned, and ensuring an effective support and inspection service. The holder of a right is required to manage all environmental impacts in accordance with an approved Environmental Management Programme and as an integral part of the operation. The holder is responsible for environmental rehabilitation and any environmental damage, pollution or ecological degradation as a result of the mining operations. There have been a number of recent amendments to legislation governing environmental matters in South Africa, but the core obligations of mining right holders are contained in the approved environmental management programmes associated with their mining rights. Recently the National Environmental Management Act, 1998 has taken on further relevance in the mining industry, as holders of new rights are now required to obtain environmental authorisations under that Act. The Mineral and Petroleum Resources Royalty Act (“the Royalty Act”) came into effect on 1 May 2009 and in terms of the Royalty Act, holders of mining rights in South Africa are required to pay a royalty to the National Revenue Fund. 0.5% + ((earnings before interest and taxes/(gross sales x 9)) x 100). The percentage determined in accordance is therefore subject to a minimum of 0.5%, but must however not exceed 7%. Possession and dealing in rough diamonds is governed by the Diamonds Act, 56 of 1986 (“Diamonds Act”). Persons are not allowed to be in possession of rough diamonds unless they are producers or hold a licence or other authorisation from the appropriate authorities. The Diamonds Act sets out certain procedures aimed at increasing local beneficiation and which producers are obliged to comply with. The producers are obliged to offer 10% of their production to the State Diamond Trader (“SDT”) at fair market value and on a run of mine basis (“representative sample”). The prices at which the production is offered to the SDT is to be verified by the Government Diamond Valuator failing which an independent diamond valuator may be appointed. Once the prices have been verified or agreed, the SDT is entitled to purchase the representative sample, failing which the producer may sell them independently. In addition to the SDT process, producers are incentivised to sell a portion of their production to local diamond beneficiators and diamonds that are intended for export must first be offered for sale at the Diamond Exchange and Export Centre at fair market value before they can be exported. Read more about the mining industry in South Africa in the Mineral Council’s statistical reference guide to the South African mining sector. The Environmental Management Act, 2004 is also relevant; along with the Income Tax Act 2004 (as amended from time to time), which sets out a special regime for the mining sector; the Tanzania Investment Act, which contains provisions that guarantee profit and capital repatriation as well as access to international arbitral process; and the Explosives Act, chapter 45 of the Laws of Tanzania. The principal regulatory body for the mining sector is the Ministry. Both the Minister for Energy and Minerals and the Commissioner are the recognised licensing authorities acting individually or collectively under the Mining Act. There is an inspector of mines and other departments, which oversee the sector according to the requirements of the Mining Act. In terms of the Mining Act, the entire property and control over minerals in or under the land is vested in Tanzania. No one may prospect for minerals or carry on mining operations except under the authority of a licence issued pursuant to the Mining Act. Geological data covering the entire country is available from the Ministry and all zonal mines offices to private parties who wish to invest in the mining sector. A number of important legislative amendments were passed in Tanzania in FY 2017 including Amendments to the Mining Act, the Review and Re-Negotiation of Unconscionable Terms Act, 2017, the Permanent Sovereignty Act, 2017 and Regulations passed in terms of section 109 of the Mining Act. These amendments introduce, inter alia, local shareholding requirements, a clearance fee, encourage local beneficiation of diamonds and also increase the royalty on diamonds.